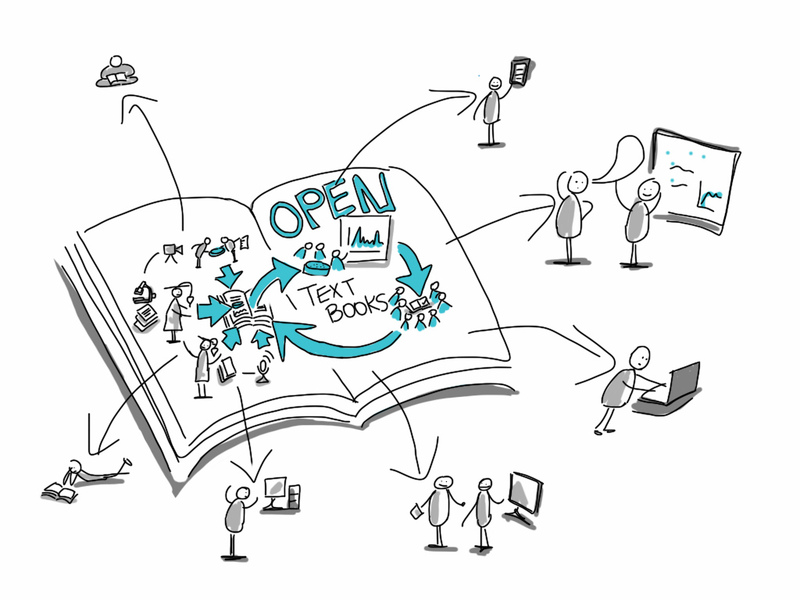 It’s no longer a question of why Open Access is important, but how we get there. The scholarly communications website provides information about new publishing models and a tool box of information including copyright guidelines, Creative Commons licensing, and authors rights. The Open Educational Resources (OER) guide is a place to find all of the work that UConn is doing to educate and encourage the use of open educational resources. OERs are focused on teaching, learning and research resources that are in the public domain or have been released under an intellectual property license that permits their free use and re-purpose by others. Our research data team can help researchers effectively manage research data, including options for publicizing your data. DigitalCommons@UConn is UConn’s electronic repository and a way to organize, store and preserve research in digital form. It is also a potential platform for open access journals, such as the recently released The Quiet Corner Interdisciplinary Journal. In February 2013, the White House’s Office of Science and Technology Policy (OSTP) required all federally funded research to be made freely available to the public within one year of publication, and required researchers to better account for and manage the digital data resulting from federally funded scientific research. This guide provides links to the federal agencies involved. Not sure where to start? Give your subject specialist a call. They can help you navigate. Want to get involved, follow along on Twitter with #oaweek. Many ARL member libraries and industry experts seek inflation-adjusted ARL library expenditures data. Now these data are available in an interactive graphical interface thanks to the work of Steve Batt, associate director of the Connecticut State Data Center—a collaboration between the University of Connecticut (UConn) Libraries, the UConn Department of Geography, and the State of Connecticut Office of Policy and Management. 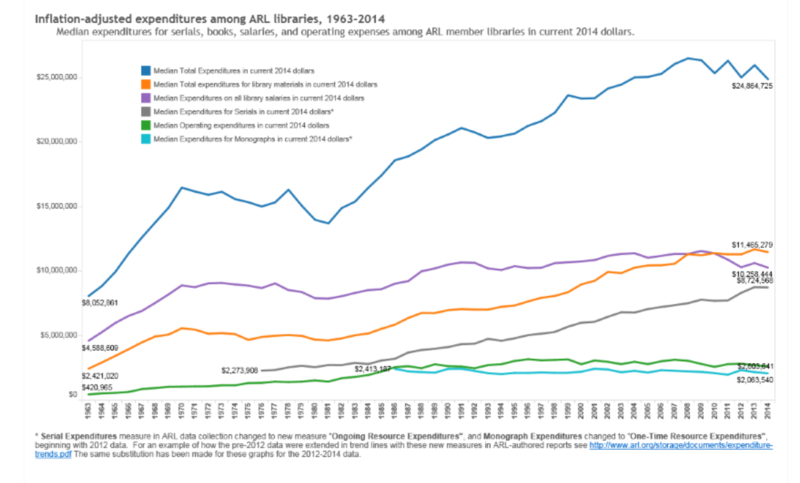 You can access and customize the graphs for “Inflation-adjusted expenditures for individual ARL libraries, 1987–2014” in addition to the “Median library expenditures among ARL libraries, 1963–2014” and “Percent change in expenditures, 1987–2014.” Batt used data from the annual ARL Statistics publication and the ARL Statistics Analytics along with Tableau data-visualization software to create these interactive graphs. Batt’s Tableau Public page includes many more data-visualization stories, including a series of interactive graphs from the US National Center for Education Statistics Academic Libraries Survey 2012 and from the ARL Library Investment Index 2003–2014, an annual summary measure of the relative size of the university library members of the Association of Research Libraries. The late U. Roberto (Robin) Romano was an accomplished photographer, award-winning filmmaker and human rights advocate who unflinchingly focused his eye and lens on children around the world capturing the violation of their rights. Since 2009, Romano had made a limited number of his images available to researchers through the UConn Libraries’ Archives & Special Collections. Now, two years after his death, his total body of work, including video tape masters and digital video files, hundreds of interviews, thousands of digital photos and prints, plus his research files have been given to UConn and will now be available to those who examine human rights issues. More than 100 of Romano’s images of child labor originally exhibited at the UConn’s William Benton Museum of Fine Art in 2006 are available online from the University Archives and Special Collections (http://hdl.handle.net/11134/20002:20110094). These are the first of the more than 130,000 still images that will be available online for research and educational use once the collection is processed. The Archives & Special Collections plans to digitize the entire collection of analog still images, negatives, and research files creating an unprecedented online resource relating to documentary journalism, child labor and human rights, and other social issues that Romano documented in his lifetime. The gift was made by the independent producer/director Len Morris, Romano’s friend of more than 30 years, with whom he collaborated on a trilogy of films focusing on children’s human rights, Stolen Childhoods (2005), Rescuing Emmanuel (2009) and the just completed, The Same Heart, in which Romano was the Director of Photography. 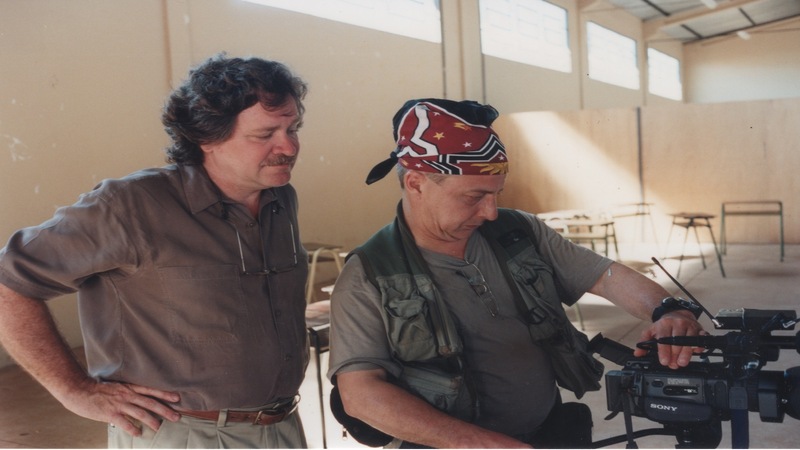 Len Morris, left, and Robin Romano filming at a school in Brazil. In physical terms, Romano’s body of work showcases his mastery of his medium, his ability to capture children in poignant, often heart wrenching conditions, and the methodology behind his award-winning work, Morris asserts. The son of the artist and Works Progress Administration (WPA) muralist Umberto Romano, Robin began his career in documentaries as a producer and cameraman for Les Productions de Sagittaire in Montreal, where he worked on several series including 5 Defis and L’Oeil de L’Aigle. Among the organizations that have used his work are GoodWeave, the Global March Against Child Labour, Human Rights Watch, Amnesty International, Free the Slaves, the International Labor Organization, Stop the Traffik, the Hunger Project, International Labor Rights Forum, the Farm Labor Organizing Committee and Antislavery International. Organizations who sponsored or funded Romano’s work will have the ability to use the images he created for them to continue their work and advocacy. 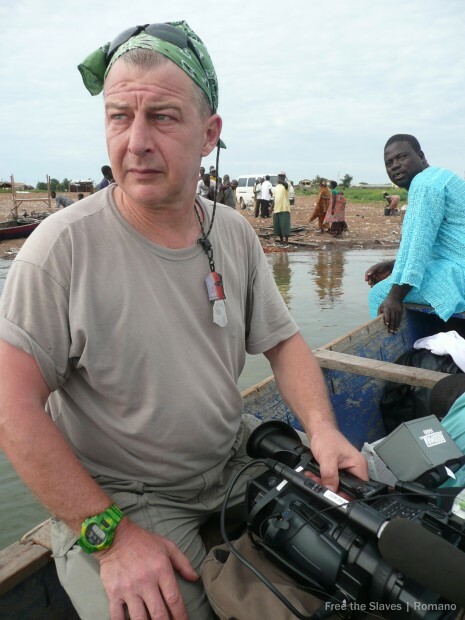 Romano’s documentaries have been widely recognized. The film The Harvest/La Cosecha received a Special Achievement Award, from American Latino Media Arts/ National Council of La Raza) in 2011, an honor he treasured, coming from the entire Latino community. A young girl carries a basket filled with 40 pounds of rock on her head. During the course of a day she will carry over a ton of rock in 100 degree plus weather. Exposure to the rock dust from the grinder causes silicosis of the lungs and inevitably leads to respitory illness and sometimes death. The start of a new semester brings a welcome flurry of activity in the Library as students get settled into the rhythm of the semester. It also brings renewed concerns over the high-cost of textbooks and other resources students need to participate fully in their classes. We know this can be frustrating for students and look to use the opportunity to gain more momentum for our continuing efforts to educate faculty and students on the myriad of high quality, open educational resources available to them. And already this semester we have some exciting news to share. At the September 21, 2015 UConn Senate Meeting, faculty Senators overwhelmingly approved the ‘Resolution in Support of the Open Textbook Initiative.’ The resolution urges faculty to utilize existing procedures to reduce costs to students including using library-licensed resources, assigning older editions of texts, rental programs, and complying with textbook request due dates form the UConn Co-op to allow them the opportunity to provide better buy back prices. Additionally, through the resolution the Senate has encouraged faculty to continue to explore means to increase the use of high quality, low or no cost accessible materials. Having the faculty behind this measure is a pivotal piece of the puzzle. Gaining momentum is one thing, but Dr. Edward Neth is about to change the game. A lecturer in Chemistry and a member of the Provost’s Library Advisory Committee, Dr. Neth has done research into the availability of open source materials for the introductory chemistry courses being taught at UConn and was not able to find the right fit. So instead of updating the textbook he co-authored with other UConn faculty members, Dr. Neth has proposed creating an open source text that does fit. Already of interest to other higher educational research institutions looking to expand their open educational resources, we are working to find funding sources to help provide the support to allow him to do this. If successful, Neth has suggested that conservatively this will save his students over $400,000 over a 5 year period. If the resource is adapted by his colleagues, the savings could reach near $1,000,000! While many open textbook initiatives across the country have come from places like the library and faculty senates, here at UConn we have seen how students truly make the difference in moving critical initiatives forward. From grassroots efforts by UConnPIRG, to official student response via UConn Undergraduate Student Government (USG), we are energized by their commitment to their fellow students. USG and UConnPIRG were partners in pushing for the successful passage of CT House Bill 6117. The bill, introduced originally by Representative Haddad, 54th District does three main things: (1) requires the Board of Regents for Higher Education and UConn to establish an open source textbook pilot program that assess the use of high-quality digital open-source textbooks and promotes their use; (2) completion of a report about the pilot by July 1, 2016 addressing the potential costs savings and barriers to the program; and (3) outlining best practices for utilizing these resources moving forward. Vice Provost Bedard has been asked to serve as one of UConn’s representatives to this group, as well as USG Senator Daniel Byrd, who has been a constant support of these efforts and on the University’s Open Textbook Initiative Committee. We are looking forward to seeing that work commence. We are also beyond pleased to have the support of USG, who has recently committed funding to continuing the education efforts through an Open Textbook Symposium to be held this coming spring. This workshop will be a continuation of the efforts made in May, where we allowed faculty and staff to “kick the tires” of some of the textbooks available online and in print. As the date of that draws near, we will provide more information. In the meantime, faculty members can mark their calendars for December 2 and join the Institute for Teaching & Learning’s Lunchtime Faculty Workshop devoted to learning more about affordable textbooks.